Just like classic music that never dies, Mario Bros. has been in the heart of gamers as an all-time favorite classic that never dies. Our favorite plumber has gone through the years and evolved along the way, taking many forms and bringing in more new concepts. But what was keeping fans loyal to the title was how the developers kept and maintained the original concept. 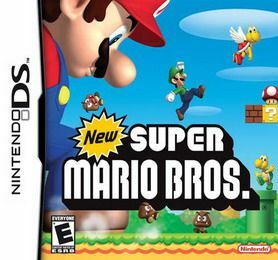 And the number 1 game for the Nintendo DS is awarded to the New Super Mario Bros. for bringing back to us the original concept that we all experienced and loved with a few “new” twists. Considering the powerful features of the Nintendo DS, New Super Mario Bros. is plain and simple. This title makes very little use of the touch screen feature, no Wi-Fi Connectivity, and nothing particularly impressive in the use of the two screens. What this remake of the Mario Bros. gives us is good old 2D side-scrolling action. Here are a few reasons why we are going to love the New Super Mario Bros. The original cast is back, doing what they are supposed to do, Princess Peach being a damsel in distress, and Mario together with his brother Luigi to the rescue. The original story that started it all. Being “new”, our hero now has some new moves at his disposal, like wall jumping, a spinning attack, new power-ups, and more. The title has some minigames and multiplayer options allowing for added replay-ability. Never has there been another remake that feels so right. This title is a perfect example that simplicity is indeed, beauty, and that classic games that captured our hearts a long time ago are bound to capture our hearts all over again. The New Super Mario Bros. has been praised all around the world and has gained the #1 spot as the best game for the Nintendo DS.